Carnoustie Creative listened carefully to our wishes and requirements before coming up with a design which fitted the bill perfectly. We are delighted with our new, modern website and would have no hesitation in recommending them. 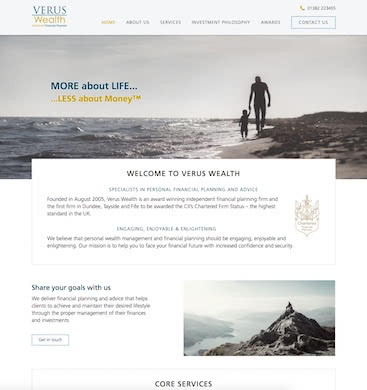 Verus Wealth Management are the leading financial advice and wealth management firm on Tayside. Their existing website was showing its age and didn’t project the modern, professional image they sought for the firm. After an initial client meeting we created a number of mockup designs that were all well received by Paul and his team. Taking cues from their existing printed materials and using the established logo, the new site presented the focus on solutions that Verus were after. Animation was used selectively to enhance user experience and a novel “Ken Burns” style effect applied to the slideshow on the homepage. Because the existing site was established and ranking well in search engines, care was taken to ensure the new site used the same URLs for equivalent pages.